Cultivation of maize in an illustration from the 16th c.
Before domestication, maize plants grew only small, 25 millimetres (1 in) long corn cobs, and only one per plant. 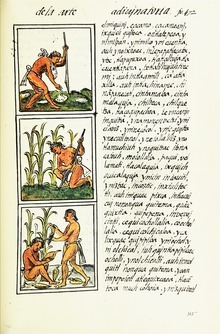 In Spielvogel’s view, many centuries of artificial selection (rather than the current view that maize was exploited by interplanting with teosinte) by the indigenous people of the Americas resulted in the development of maize plants capable of growing several cobs per plant, which were usually several centimetres/inches long each. The Olmec and Maya cultivated maize in numerous varieties throughout Mesoamerica; they cooked, ground and processed it through nixtamalization. It was believed that beginning about 2500 BC, the crop spread through much of the Americas. Research of the 21st century has established even earlier dates. The region developed a trade network based on surplus and varieties of maize crops. 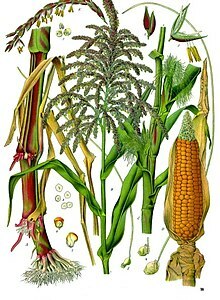 Sugar-rich varieties called sweet corn are usually grown for human consumption as kernels, while field corn varieties are used for animal feed, various corn-based human food uses (including grinding into cornmeal or masa, pressing into corn oil, and fermentation and distillation into alcoholic beverages like bourbon whiskey), and as chemical feedstocks. After the arrival of Europeans in 1492, Spanish settlers consumed maize and explorers and traders carried it back to Europeand introduced it to other countries. Spanish settlers far preferred wheat bread to maize, cassava, or potatoes. Maize flour could not be substituted for wheat for communion bread, since in Christian belief only wheat could undergo transubstantiationand be transformed into the body of Christ. Some Spaniards worried that by eating indigenous foods, which they did not consider nutritious, they would weaken and risk turning into Indians. “In the view of Europeans, it was the food they ate, even more than the environment in which they lived, that gave Amerindians and Spaniards both their distinctive physical characteristics and their characteristic personalities.” Despite these worries, Spaniards did consume maize. Archeological evidence from Florida sites indicate they cultivated it as well. Maize spread to the rest of the world because of its ability to grow in diverse climates. It was cultivated in Spain just a few decades after Columbus’s voyages and then spread to Italy, West Africa and elsewhere. The word maize derives from the Spanish form of the indigenous Taíno word for the plant, mahiz.It is known by other names around the world. The word “corn” outside North America, Australia, and New Zealand refers to any cereal crop, its meaning understood to vary geographically to refer to the local staple. In the United States,Canada, Australia, and New Zealand, corn primarily means maize; this usage started as a shortening of “Indian corn”. “Indian corn” primarily means maize (the staple grain of indigenous Americans), but can refer more specifically to multicolored “flint corn” used for decoration. Ears develop above a few of the leaves in the midsection of the plant, between the stem and leaf sheath, elongating by around 3 millimetres (0.12 in) per day, to a length of 18 cm (7 in)  with 60 cm (24 in) being the maximum alleged in the subspecies. They are female inflorescences, tightly enveloped by several layers of ear leaves commonly called husks. Certain varieties of maize have been bred to produce many additional developed ears. 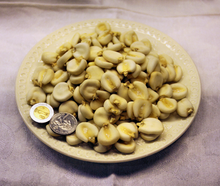 These are the source of the “baby corn” used as a vegetable in Asian cuisine. Elongated stigmas, called silks, emerge from the whorl of husk leaves at the end of the ear. They are often pale yellow and 18 cm (7 in) in length, like tufts of hair in appearance. At the end of each is a carpel, which may develop into a “kernel” if fertilized by a pollen grain. The pericarp of the fruit is fused with the seed coat referred to as “caryopsis“, typical of the grasses, and the entire kernel is often referred to as the “seed“. The cob is close to a multiple fruit in structure, except that the individual fruits (the kernels) never fuse into a single mass. The grains are about the size of peas, and adhere in regular rows around a white, pithy substance, which forms the ear. The maximum size of kernels is reputedly 2.5 cm (1 in). An ear commonly holds 600 kernels. They are of various colors: blackish, bluish-gray, purple, green, red, white and yellow. When ground into flour, maize yields more flour with much less bran than wheat does. It lacks the protein gluten of wheat and, therefore, makes baked goods with poor rising capability. A genetic variant that accumulates more sugar and less starch in the ear is consumed as a vegetable and is called sweet corn. Young ears can be consumed raw, with the cob and silk, but as the plant matures (usually during the summer months), the cob becomes tougher and the silk dries to inedibility. By the end of the growing season, the kernels dry out and become difficult to chew without cooking them tender first in boiling water. While yellow maizes derive their color from lutein and zeaxanthin, in red-colored maizes, the kernel coloration is due to anthocyanins and phlobaphenes. These latter substances are synthesized in the flavonoids synthetic pathway from polymerisation of flavan-4-ols by the expression of maize pericarp color1 (p1) gene which encodes an R2R3 myb-like transcriptional activator of the A1 gene encoding for the dihydroflavonol 4-reductase(reducing dihydroflavonols into flavan-4-ols) while another gene (Suppressor of Pericarp Pigmentation 1 or SPP1) acts as a suppressor. The p1 gene encodes an Myb-homologous transcriptional activator of genes required for biosynthesis of red phlobaphene pigments, while the P1-wr allele specifies colorless kernel pericarp and red cobs, and unstable factor for orange1 (Ufo1) modifies P1-wr expression to confer pigmentation in kernel pericarp, as well as vegetative tissues, which normally do not accumulate significant amounts of phlobaphene pigments. The maize P gene encodes a Myb homolog that recognizes the sequence CCT/AACC, in sharp contrast with the C/TAACGG bound by vertebrate Myb proteins. Maize is an annual grass in the family Gramineae, which includes such plants as wheat, rye, barley, rice, sorghum, and sugarcane. There are two major species of the Zea genus: Zea mays (maize) and Zea diploperennis, which is a perennial type of teosinte. The annualteosinte variety called Zea mays mexicana is the closest botanical relative to maize. It still grows in the wild as an annual in Mexico and Guatemala. Maize is a diploid with 20 chromosomes (n=10). The combined length of the chromosomes is 1500 cM. 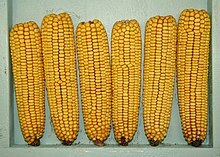 Some of the maize chromosomes have what are known as “chromosomal knobs”: highly repetitive heterochromatic domains that stain darkly. Individual knobs are polymorphicamong strains of both maize and teosinte. In 2005, the US National Science Foundation (NSF), Department of Agriculture (USDA) and the Department of Energy (DOE) formed a consortium to sequence the B73 maize genome. The resulting DNA sequence data was deposited immediately into GenBank, a public repository for genome-sequence data. Sequences and genome annotations have also been made available throughout the project’s lifetime at the project’s official site. Maize breeding in prehistory resulted in large plants producing large ears. Modern breeding began with individuals who selected highly productive varieties in their fields and then sold seed to other farmers. James L. Reid was one of the earliest and most successful developing Reid’s Yellow Dent in the 1860s. These early efforts were based on mass selection. Later breeding efforts included ear to row selection (C. G. Hopkins c. 1896), hybrids made from selected inbred lines (G. H. Shull, 1909), and the highly successful double cross hybrids using four inbred lines (D. F. Jones c. 1918, 1922). University supported breeding programs were especially important in developing and introducing modern hybrids (Ref Jugenheimer Hybrid Maize Breeding and Seed Production pub. 1958). By the 1930s, companies such as Pioneer devoted to production of hybrid maize had begun to influence long term development. Internationally important seed banks such as the International Maize and Wheat Improvement Center (CIMMYT) and the US bank at the Maize Genetics Cooperation Stock Center University of Illinois at Urbana-Champaign maintain germplasm important for future crop development. Genetic studies, published in 2004 by John Doebley, identified Zea mays ssp. parviglumis, native to the Balsas River valley in Mexico’s southwestern highlands, and also known as Balsas teosinte, as being the crop wild relative teosinte genetically most similar to modern maize. This was confirmed by further studies, which refined this hypothesis somewhat. Archaeobotanical studies, published in 2009, point to the middle part of the Balsas River valley as the likely location of early domestication; this river is not very long, so these locations are not very distant. Stone milling tools with maize residue have been found in an 8,700 year old layer of deposits in a cave not far from Iguala, Guerrero. As maize was introduced to new cultures, new uses were developed and new varieties selected to better serve in those preparations. Maize was the staple food, or a major staple – along with squash, Andean region potato, quinoa, beans, and amaranth – of most pre-Columbian North American, Mesoamerican, South American, and Caribbean cultures. 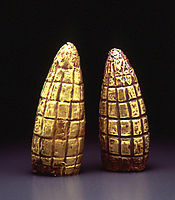 The Mesoamerican civilization, in particular, was deeply interrelated with maize. Its traditions and rituals involved all aspects of maize cultivation – from the planting to the food preparation. 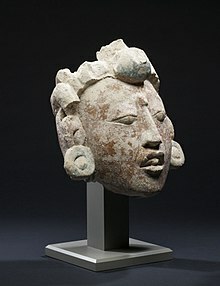 Maize formed the Mesoamerican people’s identity. In 1939, George Beadle demonstrated that the kernels of teosinte are readily “popped” for human consumption, like modern popcorn. Some have argued it would have taken too many generations of selective breeding to produce large, compressed ears for efficient cultivation. However, studies of the hybrids readily made by intercrossing teosinte and modern maize suggest this objection is not well founded. 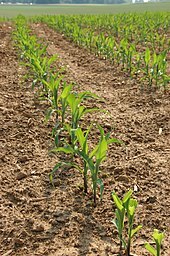 Because it is cold-intolerant, in the temperate zones maize must be planted in the spring. Its root system is generally shallow, so the plant is dependent on soil moisture. As a plant that uses C4 carbon fixation, maize is a considerably more water-efficient crop than plants that use C3 carbon fixation such as alfalfa and soybeans. 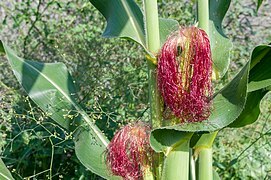 Maize is most sensitive to drought at the time of silk emergence, when the flowers are ready for pollination. 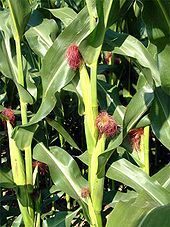 In the United States, a good harvest was traditionally predicted if the maize was “knee-high by the Fourth of July“, although modern hybrids generally exceed this growth rate. 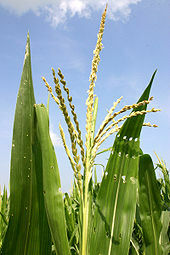 Maize used for silage is harvested while the plant is green and the fruit immature. Sweet corn is harvested in the “milk stage”, after pollination but before starch has formed, between late summer and early to mid-autumn. Field maize is left in the field until very late in the autumn to thoroughly dry the grain, and may, in fact, sometimes not be harvested until winter or even early spring. The importance of sufficient soil moisture is shown in many parts of Africa, where periodic drought regularly causes maize crop failure and consequent famine. Although it is grown mainly in wet, hot climates, it has been said to thrive in cold, hot, dry or wet conditions, meaning that it is an extremely versatile crop. 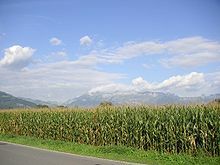 Maize was planted by the Native Americans in hills, in a complex system known to some as the Three Sisters. Maize provided support for beans, and the beans provided nitrogen derived from nitrogen-fixing rhizobiabacteria which live on the roots of beans and other legumes; and squashes provided ground cover to stop weeds and inhibit evaporation by providing shade over the soil. This method was replaced by single species hill planting where each hill 60–120 cm (2.0–3.9 ft) apart was planted with three or four seeds, a method still used by home gardeners. A later technique was “checked maize”, where hills were placed 40 in (1.0 m) apart in each direction, allowing cultivators to run through the field in two directions. In more arid lands, this was altered and seeds were planted in the bottom of 10–12 cm (3.9–4.7 in) deep furrows to collect water. Modern technique plants maize in rows which allows for cultivation while the plant is young, although the hill technique is still used in the maize fields of some Native American reservations. When maize is planted in rows, it also allows for planting of other crops between these rows to make more efficient use of land space. Before the 20th century, all maize harvesting was by manual labour, by grazing, or by some combination of those. Whether the ears were hand-picked and the stover was grazed, or the whole plant was cut, gathered, and shocked, people and livestock did all the work. Between the 1890s and the 1970s, the technology of maize harvesting expanded greatly. Today, all such technologies, from entirely manual harvesting to entirely mechanized, are still in use to some degree, as appropriate to each farm’s needs, although the thoroughly mechanized versions predominate, as they offer the lowest unit costs when scaled to large farm operations. For small farms, their unit cost can be too high, as their higher fixed cost cannot be amortized over as many units. Maize is widely cultivated throughout the world, and a greater weight of maize is produced each year than any other grain.In 2014, total world production was 1.04 billion tonnes, led by the United States with 35% of the total (table). China produced 21% of the global total. In 2016, maize (corn) production was forecast to be over 15 billion bushels, an increase of 11% over 2014 American production. Based on conditions as of August 2016, the expected yield would be the highest ever for the United States. The area of harvested maize was forecast to be 87 million acres, an increase of 7% over 2015. Maize is especially popular in Midwestern states such as Indiana and Illinois; in the latter, it was named the state’s official grain in 2017. The susceptibility of maize to the European corn borer and corn rootworms, and the resulting large crop losses which are estimated at a billion dollars worldwide for each pest, led to the development of transgenics expressing the Bacillus thuringiensis toxin. “Bt maize” is widely grown in the United States and has been approved for release in Europe. Introduced into Africa by the Portuguese in the 16th century, maize has become Africa’s most important staple food crop. Maize meal is made into a thick porridge in many cultures: from the polenta of Italy, the angu of Brazil, the mămăligă of Romania, to cornmeal mush in the US (and hominy grits in the South) or the food called mealie pap in South Africa and sadza, nshima and ugali in other parts of Africa. Maize meal is also used as a replacement for wheatflour, to make cornbread and other baked products. Masa (cornmeal treated with limewater) is the main ingredient for tortillas, atole and many other dishes of Central American food. Maize can also be harvested and consumed in the unripe state, when the kernels are fully grown but still soft. 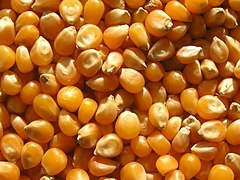 Unripe maize must usually be cooked to become palatable; this may be done by simply boiling or roasting the whole ears and eating the kernels right off the cob. Sweet corn, a genetic variety that is high in sugars and low in starch, is usually consumed in the unripe state. Such corn on the cob is a common dish in the United States, Canada, United Kingdom, Cyprus, some parts of South America, and the Balkans, but virtually unheard of in some European countries. Corn on the cob was hawked on the streets of early 19th-century New York City by poor, barefoot “Hot Corn Girls”, who were thus the precursors of hot dog carts, churro wagons, and fruit stands seen on the streets of big cities today. The cooked, unripe kernels may also be shaved off the cob and served as a vegetable in side dishes, salads, garnishes, etc. Alternatively, the raw unripe kernels may also be grated off the cobs and processed into a variety of cooked dishes, such as maize purée, tamales, pamonhas, curau, cakes, ice creams, etc. Raw, yellow, sweet maize kernels are composed of 76% water, 19% carbohydrates, 3% protein, and 1% fat (table). In a 100-gram serving, maize kernels provide 86 calories and are a good source (10-19% of the Daily Value) of the B vitamins, thiamin, niacin (but see Pellagra warning below), pantothenic acid(B5) and folate (right table for raw, uncooked kernels, USDA Nutrient Database). In moderate amounts, they also supply dietary fiber and the essential minerals, magnesium and phosphorus whereas other nutrients are in low amounts (table). “Feed maize” is being used increasingly for heating; specialized corn stoves(similar to wood stoves) are available and use either feed maize or wood pellets to generate heat. Maize cobs are also used as a biomass fuel source. Maize is relatively cheap and home-heating furnaces have been developed which use maize kernels as a fuel. They feature a large hopper that feeds the uniformly sized maize kernels (or wood pellets or cherry pits) into the fire. A biomass gasification power plant in Strem near Güssing, Burgenland, Austria, began in 2005. Research is being done to make diesel out of the biogas by the Fischer Tropschmethod. Increasingly, ethanol is being used at low concentrations (10% or less) as an additive in gasoline (gasohol) for motor fuels to increase the octane rating, lower pollutants, and reduce petroleum use (what is nowadays also known as “biofuels” and has been generating an intense debate regarding the human beings’ necessity of new sources of energy, on the one hand, and the need to maintain, in regions such as Latin America, the food habits and culture which has been the essence of civilizations such as the one originated in Mesoamerica; the entry, January 2008, of maize among the commercial agreements of NAFTA has increased this debate, considering the bad labor conditions of workers in the fields, and mainly the fact that NAFTA “opened the doors to the import of maize from the United States, where the farmers who grow it receive multimillion dollar subsidies and other government supports. (…) According to OXFAM UK, after NAFTA went into effect, the price of maize in Mexico fell 70% between 1994 and 2001. The number of farm jobs dropped as well: from 8.1 million in 1993 to 6.8 million in 2002. Many of those who found themselves without work were small-scale maize growers.”). However, introduction in the northern latitudes of the US of tropical maize for biofuels, and not for human or animal consumption, may potentially alleviate this. As a result of the US federal government announcing its production target of 35 billion US gallons (130,000,000 m3) of biofuels by 2017, ethanol production will grow to 7 billion US gallons (26,000,000 m3) by 2010, up from 4.5 billion in 2006, boosting ethanol’s share of maize demand in the US from 22.6 percent to 36.1 percent. Maize is bought and sold by investors and price speculators as a tradable commodity using corn futures contracts. These “futures” are traded on the Chicago Board of Trade (CBOT) under ticker symbol C. They are delivered every year in March, May, July, September, and December. An unusual use for maize is to create a “corn maze” (or “maize maze”) as a tourist attraction. The idea of a maize maze was introduced by the American Maze Company who created a maze in Pennsylvania in 1993. Traditional mazes are most commonly grown using yewhedges, but these take several years to mature. The rapid growth of a field of maize allows a maze to be laid out using GPS at the start of a growing season and for the maize to grow tall enough to obstruct a visitor’s line of sight by the start of the summer. In Canada and the US, these are popular in many farming communities. 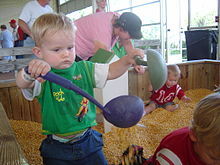 Maize kernels can be used in place of sand in a sandboxlike enclosure for children’s play. Maize is used as a fish bait, called “dough balls”. It is particularly popular in Europe for coarse fishing. A fraction of the maize feedstock dry matter used for ethanol production is usefully recovered as DDGS (dried distillers grains with solubles). In the 2010/2011 marketing year, about 29.1 million tonnes of DDGS were fed to US livestock and poultry.Because starch utilization in fermentation for ethanol production leaves other grain constituents more concentrated in the residue, the feed value per kg of DDGS, with regard to ruminant-metabolizable energy and protein, exceeds that of the grain. Feed value for monogastric animals, such as swine and poultry, is somewhat lower than for ruminants. Maize was introduced into the diet of nonindigenous Americans without the necessary cultural knowledge acquired over thousands of years in the Americas. In the late 19th century, pellagra reached epidemic proportions in parts of the southern US, as medical researchers debated two theories for its origin: the deficiency theory (which was eventually shown to be true) said that pellagra was due to a deficiency of some nutrient, and the germ theory said that pellagra was caused by a germ transmitted by stable flies. A third theory, promoted by the eugenicist Charles Davenport, held that people only contracted pellagra if they were susceptible to it due to certain “constitutional, inheritable” traits of the affected individual. Jump up^ “The Evolution of Corn”. University of Utah HEALTH SCIENCES. Retrieved 2 January 2016. Jump up^ “Archaeological evidence of teosinte domestication from Guilá Naquitz, Oaxaca”. PNAS. Retrieved 2 April 2018. Jump up^ “Please settle a dispute. Is sweet corn a vegetable or a grain? What is the difference? How about field corn? – eXtension”. USDA National Institute of Food and Agriculture, New Technologies for Ag Extension project. Retrieved 2018-08-03. Jump up^ Linda Campbell Franklin, “Corn,” in Andrew F. Smith (ed. ), The Oxford Encyclopedia of Food and Drink in America. 2nd ed. Oxford: Oxford University Press, 2013 (pp. 551–558), p. 553. Jump up^ Benz, Bruce F. (2005). “Archaeological evidence of teosinte domestication from Guilá Naquitz, Oaxaca”. Proceedings of the National Academy of Sciences. National Academy of Sciences of the United States of America. 98 (4): 2104–2106. doi:10.1073/pnas.98.4.2104. JSTOR 3055008. PMC 29389. PMID 11172083. Jump up^ “Origin, History and Uses of Corn”. Iowa State University, Department of Agronomy. February 11, 2014. Archived from the original on February 23, 2014. ^ Jump up to:a b c Matsuoka, Y.; Vigouroux, Y.; Goodman, M. M.; et al. (2002). “A single domestication for maize shown by multilocus microsatellite genotyping”. Proceedings of the National Academy of Sciences. 99 (9): 6080–4. doi:10.1073/pnas.052125199. PMC 122905. PMID 11983901. Jump up^ Matsuoka,, Yoshihiro (22 January 2003). “Earliest Directional Evolution for Microsatellite Size in Maize” (PDF). Science. Retrieved 3 March 2014. Jump up^ Pagán-Jiménez, Jaime R.; Guachamín-Tello, Ana M.; Romero-Bastidas, Martha E.; Constantine-Castro, Angelo R. (2015). “Late ninth millennium B.P. use of Zea mays L. at Cubilán area, highland Ecuador, revealed by ancient starches”. Quaternary International. 404: 137–155. doi:10.1016/j.quaint.2015.08.025. ISSN 1040-6182. Jump up^ “Los antiguos peruanos comían palomitas de maíz”. BBC Mundo. BBC. 19 Jan 2012. Jump up^ “Did man follow plants or did plants follow man? Tracks of prehistoric man and ways of contact in the Americas according to cultivated plants. Case study – Maize (translated from Portuguese)”. Yumpu. 2015. Retrieved October 13,2015. Jump up^ Spielvogel, Jackson J. (1 March 2005). Medieval and Early Modern Times: Discovering Our Past. Glencoe/McGraw-Hill School Publishing Company. ISBN 978-0-07-868876-8. ^ Jump up to:a b Roney, John (Winter 2009). “The Beginnings of Maize Agriculture”. Archaeology Southwest. 23 (1): 4. Jump up^ “US Approves Corn Modified for Ethanol”. The New York Times. February 11, 2011. Jump up^ Rebecca Earle, The Body of the Conquistador: Food, Race, and the Colonial Experience in Spanish America, 1492–1700. New York: Cambridge University Press 2012, pp. 17, 151. Jump up^ Earle, The Body of the Conquistador, p. 5. ^ Jump up to:a b Earle, The Body of the Conquistador, p. 144. Jump up^ “maize”. Oxford English Dictionary, online edition. 2012. Accessed June 7, 2012. ^ Jump up to:a b c “corn”. Oxford English Dictionary, online edition. 2012. Accessed June 7, 2012. ^ Jump up to:a b Ensminger, Audrey H. (1994). Foods and Nutrition Encyclopedia, 2nd ed. CRC Press. p. 479. ISBN 0-8493-8980-1. The word “maize” is preferred in international usage because in many countries the term “corn”, the name by which the plant is known in the United States, is synonymous with the leading cereal grain; thus, in England “corn” refers to wheat, and in Scotland and Ireland it refers to oats. Jump up^ Boberg, Charles (2010). The English Language in Canada: Status, History and Comparative Analysis. Cambridge University Press. p. 109. ISBN 1-139-49144-X. Jump up^ Rhodes, L. L.; Eagles, H. A. (1984). “Origins of maize in New Zealand”. New Zealand Journal of Agricultural Research. 27 (2): 151–156. doi:10.1080/00288233.1984.10430414. Jump up^ “mealie”, Oxford English Dictionary, online edition, 2012. Accessed June 7, 2012. ^ Jump up to:a b c Wellhausen, Edwin John (1952). Races of Maize in Mexico. Jump up^ Karl, J.R. (Jan 2012). “The Maximum Leaf Number of the Maize Subspecies” (PDF). The Maize Genetics Cooperation Newsletter. 86: 4. ISSN 1090-4573. Archived from the original (PDF) on March 3, 2016. Retrieved July 5,2013. Jump up^ Stevenson, J. C.; Goodman, M. M. (1972). “Ecology of Exotic Races of Maize. I. Leaf Number and Tillering of 16 Races Under Four Temperatures and Two Photoperiods1”. Crop Science. 12 (6): 864. doi:10.2135/cropsci1972.0011183X001200060045x. Jump up^ Karl, J. R. (2007). “Jala Maize is Small” (PDF). Maize Genetics MNL. 89: e3. Archived from the original (PDF) on August 8, 2017. Retrieved November 19, 2015. Jump up^ Grobman, Alexander (1961). 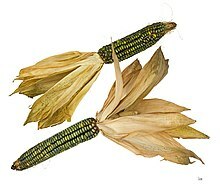 Races of Maize in Peru. Jump up^ Gautam, P.; Gustafson, DM; Wicks III, Z (2011). “Phosphorus Concentration, Uptake and Dry Matter Yield of Corn Hybrids” (PDF). World Journal of Agricultural Sciences. 7 (4): 418–424. ISSN 1817-3047. Jump up^ Karl, J.R. (Jan 2002). “Maize is Not Day Neutral; Day Length and Flowering” (PDF). The Maize Genetics Cooperation Newsletter. 89: e7. Archived from the original(PDF) on August 8, 2017. Retrieved September 6, 2015. Jump up^ Paliwal, R. L (2000). Tropical maize: Improvement and production. ISBN 9789251044575. Jump up^ “Unique gene combinations control tropical maize response to day lengths”. Eurekalert.org. June 14, 2011. Retrieved November 14, 2013. Jump up^ “Elongated mesocotyl1, a phytochrome-deficient mutant of maize”. Brutnell Lab. Archived from the original on December 11, 2013. Retrieved December 7, 2013. Jump up^ “ACES News :: College of ACES, University of Illinois”. Jump up^ “Corn Stalk Lodging” (PDF). Monsanto Imagine. October 2, 2008. Archived from the original (PDF) on February 25, 2009. Retrieved February 23, 2009. Jump up^ Himi, E; Mares, DJ; Yanagisawa, A; Noda, K (2002). “Effect of grain color gene (R) on grain dormancy and sensitivity of the embryo to abscisic acid (ABA) in wheat”. Journal of Experimental Botany. 53 (374): 1569–74. doi:10.1093/jxb/erf005. PMID 12096095. Jump up^ Winkel-Shirley, B (2001). “Flavonoid biosynthesis. A colorful model for genetics, biochemistry, cell biology, and biotechnology”. Plant Physiology. 126 (2): 485–93. doi:10.1104/pp.126.2.485. PMC 1540115. PMID 11402179. ^ Jump up to:a b Chopra, S; Cocciolone, SM; Bushman, S; Sangar, V; McMullen, MD; Peterson, T (2003). “The maize unstable factor for orange1 is a dominant epigenetic modifier of a tissue specifically silent allele of pericarp color1”. Genetics. 163 (3): 1135–1146. PMC 1462483. PMID 12663550. Jump up^ Structural And Transcriptional Analysis Of The Complex P1-wr Cluster In Maize. Wolfgang Goettel, Joachim Messing. Plant & Animal Genomes XVI Conference ArchivedFebruary 18, 2012, at the Wayback Machine. Jump up^ Dong, X; Braun, EL; Grotewold, E (2001). “Functional conservation of plant secondary metabolic enzymes revealed by complementation of Arabidopsis flavonoid mutants with maize genes”. Plant Physiology. 127 (1): 46–57. doi:10.1104/pp.127.1.46. PMC 117961. PMID 11553733. Jump up^ Lee, E.A. ; Harper, V (2002). “Suppressor of Pericarp Pigmentation 1 (SPP1), a novel gene involved in phlobaphene accumulation in maize (Zea mays L.) pericarps”. Maydica. 47(1): 51–58. INIST:13772300. Jump up^ Grotewold, Erich; Drummond, Bruce J.; Bowen, Ben; Peterson, Thomas (1994). “The myb-homologous P gene controls phlobaphene pigmentation in maize floral organs by directly activating a flavonoid biosynthetic gene subset”. Cell. 76 (3): 543–53. doi:10.1016/0092-8674(94)90117-1. PMID 8313474. Jump up^ Irisch, Erin E. (1997). “CLASS II TASSEL SEED MUTATIONS PROVIDE EVIDENCE FOR MULTIPLE TYPES OF INFLORESCENCE MERISTEMS IN MAIZE (POACEAE)”. American Journal of Botany. 84 (11): 1502. doi:10.2307/2446611. Jump up^ Montgomery E (1906). “What is an ear of corn?”. Popular Science Monthly. 68 (January). Jump up^ “Corn – Oxford Reference”. Retrieved 2017-12-04. Jump up^ Brown, David (November 20, 2009). “Scientists have high hopes for corn genome”. The Washington Post. Jump up^ “Welcome to MaizeGDB”. Jump up^ “Welcome to MaizeSequence.org”. MaizeSequence.org. Retrieved September 21, 2013. Jump up^ “Researchers sequence genome of maize, a key crop”. Reuters. Retrieved October 6, 2014. Jump up^ Schnable, P. S.; Ware, D.; Fulton, R. S.; et al. (2009). “The B73 Maize Genome: Complexity, Diversity, and Dynamics”. Science. 326 (5956): 1112–5. doi:10.1126/science.1178534. PMID 19965430. Jump up^ Feschotte, C.; Pritham, E. (2009). “A cornucopia of Helitrons shapes the maize genome”. Proceedings of the National Academy of Sciences. 106 (47): 19747–19748. doi:10.1073/pnas.0910273106. PMC 2785235. PMID 19926864. ^ Jump up to:a b Rosenberg, Tina (April 9, 2014). “A Green Revolution, This Time for Africa”. Jump up^ Duvick, D. N. & Cassman, K. G. (2009). “Post-green-revolution trends in yield potential of temperate maize in the north-central United States”. Crop Science. 39 (6): 1622–1630. doi:10.2135/cropsci1999.3961622x. Archived from the original on November 15, 2009. ^ Jump up to:a b c James, Clive (2016). “Global Status of Commercialized Biotech/GM Crops: 2016 – ISAAA Brief 52-2016”. ISAAA. Archived from the original on 2017-05-04. Retrieved 2017-08-26. Jump up^ “National Agricultural Statistics Service (NASS), Agricultural Statistics Board, US Department of Agriculture, Acreage report for 2010” (PDF). Jump up^ “ISAAA Biotech Maize Update 2011” (PDF). Archived from the original (PDF) on May 24, 2013. Retrieved October 6, 2014. Jump up^ “ISAAA Pocket K No. 2: Plant Products of Biotechnology, 2011”. Retrieved October 6, 2014. Jump up^ Andrew Pollack (September 23, 2000). “Kraft Recalls Taco Shells With Bioengineered Corn”. The New York Times. ^ Jump up to:a b “Corn genetics study”. U N I V E R S E. Retrieved October 6, 2014. ^ Jump up to:a b c Wilkes, Garrison (8 March 2004). “Chapter 1.1 Corn, strange and marvelous: but is a definitive origin known?”. In Smith, C. Wayne; Betrán, Javier; Runge, E. C. A. Corn: Origin, History, Technology, and Production. John Wiley & Sons. pp. 3–63. ISBN 978-0-471-41184-0. Jump up^ Hyams, Edward (1990). The Last of the Incas: The Rise and Fall of an American Empire. Dorset Press. ISBN 978-0-88029-595-6. Jump up^ Doebley, John F. (2004). “The genetics of maize evolution” (PDF). Annual Review of Genetics. 38: 37–59. doi:10.1146/annurev.genet.38.072902.092425. PMID 15568971. Jump up^ ““Wild grass became maize crop more than 8,700 years ago”, National Science Foundation, News Release atEurekalert March 24, 2009″. March 23, 2009. Retrieved October 6, 2014. ^ Jump up to:a b Ranere, Anthony J.; Piperno, Dolores R.; Holst, Irene; et al. (2009). “The cultural and chronological context of early Holocene maize and squash domestication in the Central Balsas River Valley, Mexico” (PDF). Proceedings of the National Academy of Sciences. 106 (13): 5014–5018. doi:10.1073/pnas.0812590106. PMC 2664064. PMID 19307573. Jump up^ Ranere, Anthony J.; Piperno, Dolores R.; Holst, Irene; et al. (2009). “Starch grain and phytolith evidence for early ninth millennium B.P. maize from the Central Balsas River Valley, Mexico” (PDF). Proceedings of the National Academy of Sciences. 106 (13): 5019–5024. doi:10.1073/pnas.0812525106. PMC 2664021. PMID 19307570. Jump up^ Evan Peacock, Wendell R. Haag & Melvin L. Warren, Jr. (2005). “Prehistoric decline in freshwater mussels coincident with the advent of maize agriculture” (PDF). Conservation Biology. 19 (2): 547–551. doi:10.1111/j.1523-1739.2005.00036.x. Jump up^ Mann, Charles C. (July 2011). “Cotton (or Anchovies) and Maize”. 1491: New Revelations of the Americas Before Columbus (2nd ed.). New York: Vintage Books. pp. 225–229. ISBN 978-1-4000-3205-1. Jump up^ Diderot, Denis. “Maize”. The Encyclopedia of Diderot & d’Alembert: Collaborative Translations Project. Retrieved April 1, 2015. Jump up^ Van Devender, Karl (July 2011). “Grain Drying Concepts and Options” (PDF). University of Arkansas Division of Agriculture. Retrieved December 15, 2013. Jump up^ International Grains Council (international organization)(2013). “International Grains Council Market Report 28 November 2013” (PDF). Jump up^ “Maize production in 2014, Crops/Regions/Production Quantity from pick lists”. United Nations, Food and Agriculture Organization, Statistics Division (FAOSTAT). 2014. Retrieved 4 April 2017. ^ Jump up to:a b c “Crop production, 2016” (PDF). US Department of Agriculture. 12 August 2016. Retrieved 4 April 2017. Jump up^ Janssen, Kim (December 28, 2017). “Exciting days for corn lovers as corn to become official state grain of Illinois”. Chicago Tribune. Jump up^ “fall armyworm, Spodoptera frugiperda (J.E. Smith)”. entnemdept.ufl.edu. Retrieved 2017-11-14. Jump up^ Pechan, Tibor; Ye, Lijun; Chang, Yu-min; Mitra, Anurina; Lin, Lei; Davis, Frank M.; Williams, W. Paul; Luthe, Dawn S. (2000-07-01). “A Unique 33-kD Cysteine Proteinase Accumulates in Response to Larval Feeding in Maize Genotypes Resistant to Fall Armyworm and Other Lepidoptera”. The Plant Cell. 12 (7): 1031–1040. doi:10.1105/tpc.12.7.1031. ISSN 1040-4651. PMC 149047. PMID 10899972. Jump up^ Marra, M.C., Piggott, N.E., & Goodwin, B.K. (2012). “The impact of corn rootworm protected biotechnology traits in the United States”. AgBioForum. 15 (2): 217–230. Jump up^ “The cassava transformation in Africa“. The Food and Agriculture Organization of the United Nations (FAO). Jump up^ “Chapter 8: Improvement of maize diets; from corporate document: Maize in human nutrition”. United Nations Food and Agriculture Organization. 1992. Retrieved 5 June 2017. Jump up^ Liggett, R. Winston; Koffler, H. (December 1948). “Corn steep liquor in microbiology”. Bacteriological Reviews. 12(4): 297–311. PMC 180696. PMID 16350125. Jump up^ “Corn for Home Heat: A Green Idea That Never Quite Popped”. 2015-03-02. Retrieved 2017-07-07. Jump up^ Torres, Andres F.; Slegers, Petronella M.; Noordam-Boot, Cornelie M. M.; Dolstra, Oene; Vlaswinkel, Louis; van Boxtel, Anton J. B.; Visser, Richard G. F.; Trindade, Luisa M. (2016-03-15). “Maize feedstocks with improved digestibility reduce the costs and environmental impacts of biomass pretreatment and saccharification”. Biotechnology for Biofuels. 9: 63. doi:10.1186/s13068-016-0479-0. ISSN 1754-6834. PMC 4791978. PMID 26981155. Jump up^ “Fuel Ethanol Plants – Thermal Kinetics Engineering, PLLC”. Thermal Kinetics Engineering, PLLC. Retrieved 2017-07-07. Jump up^ Mark Clayton (January 28, 2008). “Christian Science Monitor”. The Christian Science Monitor. Retrieved October 6, 2014. Jump up^ “Iowa Renewable Fuels Association”. Archived from the original on October 11, 2014. Retrieved October 6, 2014. Jump up^ “Revista Envío – Are Free Trade Agreements Free? Are They Development Strategies?”. Jump up^ “IBISWorld”. Archived from the original on 2008-04-02. Jump up^ “Maize Quest Fun Park: Corn Box”. Archived from the original on October 12, 2007. Retrieved October 8, 2007. Jump up^ “2009 US Corn Stats” (PDF). Iowa Corn. Retrieved December 2, 2010. Jump up^ United States Department of Agriculture, Economic Research Service. Corn supply, disappearance, and share of total corn used for ethanol. www.ers.usda.gov/datafiles/US_Bioenergy/Feedstocks/table05.xls (Excel file, accessed June 29, 2015). ^ Jump up to:a b Hoffman, L. and A. Baker. 2011. Estimating the substitution of distillers’grains for corn and soybean meal in the U.S. feed complex. United States Department of Agriculture, Economic Research Service. FDS-11-l-01. 62 pp. Jump up^ “National Nutrient Database for Standard Reference Release 28”. United States Department of Agriculture: Agricultural Research Service. Jump up^ “Nutrition facts, calories in food, labels, nutritional information and analysis”. NutritionData.com. Jump up^ “USDA Table of Nutrient Retention Factors, Release 6”(PDF). USDA. USDA. Dec 2007. ^ Jump up to:a b “Nutritional Effects of Food Processing”. NutritionData.com. Jump up^ “Nutrient data laboratory”. United States Department of Agriculture. Retrieved August 10, 2016. Jump up^ “The origins of maize: the puzzle of pellagra”. EUFIC > Nutrition > Understanding Food. The European Food Information Council. December 2001. Archived from the original on September 27, 2006. Retrieved September 14,2006. Jump up^ Staller, John; Carrasco, Michael (24 November 2009). Pre-Columbian Foodways: Interdisciplinary Approaches to Food, Culture, and Markets in Ancient Mesoamerica. Springer Science & Business Media. p. 317. ISBN 978-1-4419-0471-3. Jump up^ Thompson, Janice J.; Manore, Melinda; Vaughan, Linda (15 January 2016). “Nutrients involved in energy metabolism”. The Science of Nutrition. Pearson Education. pp. 292–321. ISBN 978-0-13-429880-1. Also ISBN 978-0-321-64316-2. Jump up^ Berrin, Katherine & Larco Museum. The Spirit of Ancient Peru: Treasures from the Museo Arqueológico Rafael Larco Herrera. New York: Thames and Hudson, 1997. Jump up^ Croatian National Bank. Kuna and Lipa, Coins of CroatiaArchived June 22, 2009, at the Wayback Machine. : 1 Lipa Coin Archived June 28, 2011, at the Wayback Machine.. Retrieved on March 31, 2009. Ferro, D.N. & Weber, D.C. “Managing Sweet Corn Pests in Massachusetts”.